Sometimes the appetizer tastes ‘way better than the dessert. So it is with Berkeley Opera’s delicious double bill of fairy tales being performed at the Julia Morgan Center for the Arts. 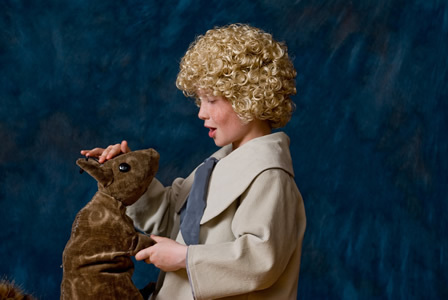 Maurice Ravel’s “L’enfant et les Sortileges” is a yummy froth of puppets, dancing forest creatures and delightful music. However it seems a mere mouthful, coming as it does after the powerful “Bluebeard’s Castle.” That two-person Bela Bartok opera, beautifully sung by Paul Murray as the Duke who collects wives like other people collect antiques and Kathleen Moss as his latest acquisition, is so gripping on a dark stage enveloped by Naomie Kremer’s video projections of a ghastly castle that anything that follows is a trifle. They should have been switched. The Ravel would have been a great curtain raiser and then all the little kids could go home before Bartok’s gloomy bloodbath. But strange are the ways of opera companies and a big bouquet to Berkeley’s for reviving these two rarely-performed gems of the repertoire. Truly a pair of modern masterpieces, they prove that 20th Century music is not all atonality and minimalism. The Bartok, particularly, weds music and action seamlessly to build an almost unbearable suspense. I mean, we all know what happened to Bluebeard’s wives, don’t we? But, when Judith (Moss) leaves her father, brother and former fiancée to follow her heart, we can’t help rooting for her. Bluebeard’s castle is a foreboding place; the walls weep and there is blood on the floor. The man himself just wants somebody to love him unconditionally, to redeem him through that love, but she just can’t let it alone. Of course, the drama goes far beyond the fairy tale. There is a genuine psychological realism here as Judith peels away the layers of Bluebeard’s mind like the skin of an onion. And, in spite of warnings and some pretty creepy evidence, she keeps insisting that he open those locked doors. And we all know what curiosity did to the apocryphal cat. It was edge-of-your-seat gripping and, under Jonathan Khuner’s baton, impeccably performed, perfect for the small Julia Morgan stage. “L’Enfant” is quite another kettle of fish – and squirrels and bats and cats. Penned in 1925, it demonstrates Ravel’s gift of lush orchestration and inventive writing: styles range from faux orientalism to jazz to folk idioms and a measured madrigal. A dragonfly sings and dances to a lilting waltz. The music is gorgeous and again, Khuner’s orchestra did it proud. The slight story involves a petulant child who, confined to his room for laziness and rudeness, proceeds to break everything around him, throwing chairs, smashing china, ripping the pages out of his books. But then all that stuff, both animate and inanimate turns on him, voicing complaints and exacting revenge. A lesson is learned — in this case before it is too late. A charming set design and a gorgeous cartoon back curtain by Berkeley artist Ariel evoke the fairy tale mood and Michael and Valerie Nelson’s puppets are both hilarious and inspired. Again, good use is made of a giant video screen at the rear of the stage and Jeremy Knight’s digital animation reaches a brilliant climax with an arithmetic book gone berserk. Boy soprano Patrick Dowd, who shares the role of the Child with Misha Brooks, did well, after somebody remembered to turn on his body mike. Twelve singers portrayed the various characters and four dancers executed Cecily Khuner’s choreography for courting cats, leaping grandfather clocks and various pirouetting forest denizens. It was fast; it was fun and it sent everybody out of the theater in a good mood. But it should have come first.